Clearly I'd forgotten just how comfortable these flared jeans are, as this is the first time I've worn them since possibly last April. That sounds bad. But all those fall and winter days I could have been wearing them I was caught in the monotony of cycling through the same four pairs of skinny jeans. There's a lot of my closet which went unworn over the last two seasons. It's about time to get reacquainted with the rest of my wardrobe that isn't "really old grey sweater" and "really old white sweater", which I've essentially been living in all winter, and these past couple weeks of "spring". I think you look nothing like a pirate, Lydia!!! In fact, you look amazing!! I think part of my love for skinny jeans when it's colder is the fact they tuck into boots so much easier!! So that's the excuse you can use for not wearing these jeans..ha ha!! 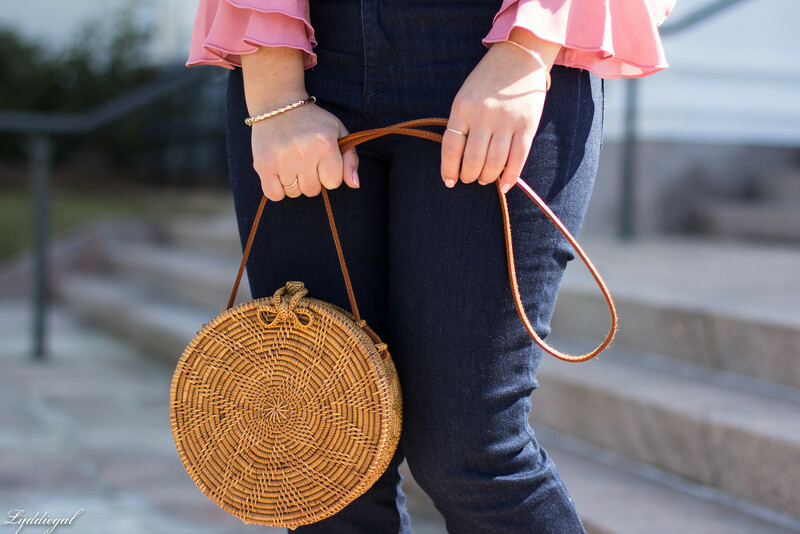 I always find flared jeans challenging, but especially in the winter, when the hems can so easily get wet even if you've had the jeans tailored to the right length. When I first moved to Vancouver, I remember my flared jeans absorbing so much water on rainy days that I would be wet up to the knee. It was awful, and I quickly swore of flares entirely. I do love how a good pair looks, though, and these ones, paired with those statement sleeves and your silk neck scarf, really are just perfectly lovely. That top is so fun!! I've been the same way with my flares, it's just hard to wear them knowing there's puddles of grossness on the ground and I have to wear heels with them.. GAH! That blouse is beautiful! Definitely not a pirate vibe in sight! 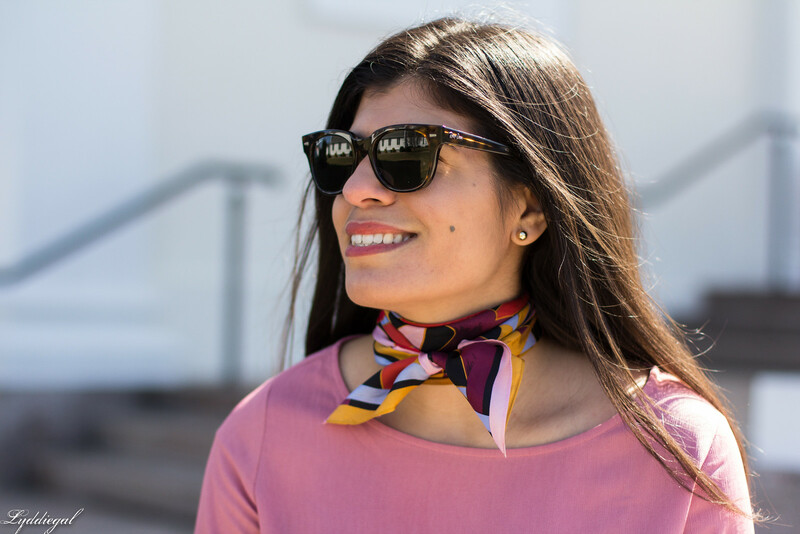 The colorful scarf around your neck looks fabulous with it! Good thing you went for that top - it's a lovely shade and I love the sleeves! 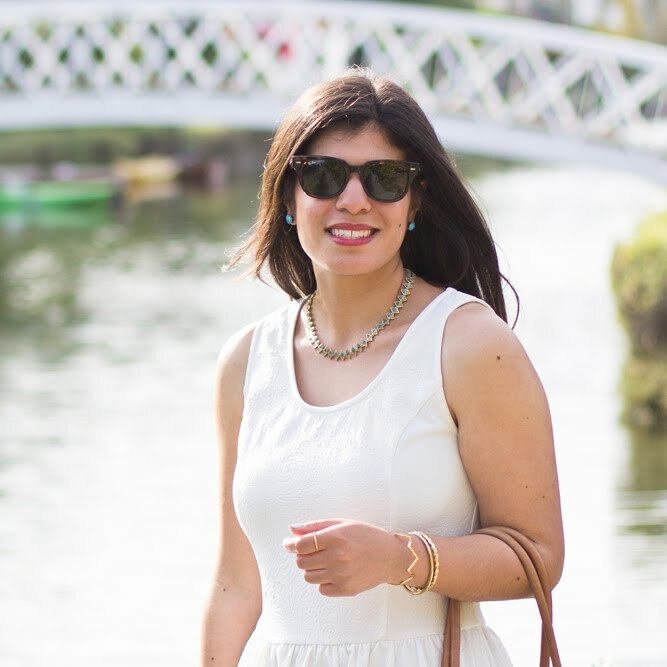 Sending you more spring vibes for better weather! I am happy to see you are getting warmer weather (this is me writing as a rain storm falls) and that you went for that top. It looks really good and the scarf was the perfect choice. No pirate resemblance at all! Love that top! It is perfect with your flare jeans! My flare jeans are rips from being dragged on the ground! Even with heels! You definitely don't look like a pirate (and I loved the reference to that classic) - it's a gorgeous top! You look so cute nothing like a pirate. I always say I need to tie my scarves around my neck but never do, this is so cute. This top is so cute! I would never have thought pirate. I like how you paired it with this scarf! This is such a great combination! I love how you added the little scarf, too! Such a cute look! Love the top. The sleeves are so much fun. And I adore the scarf! Very non pirate, no worries. Looks great on you! Flared jeans used to be my favorite when I was younger... thinking about getting a pair! What a great outfit!! That scarf is to die for! Super cute outfit! I love blush pink and it looks lovely on you. 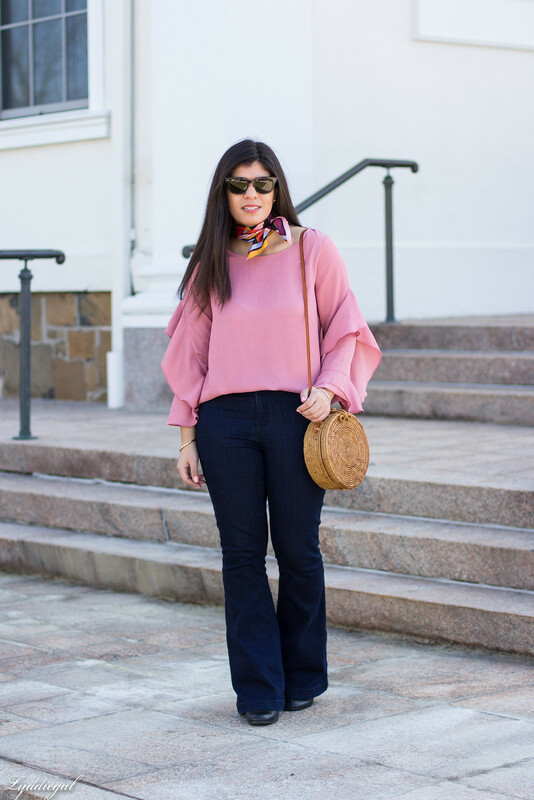 I know exactly what you mean about the ruffled sleeves! There are several trends I have tried to avoid, but somehow fell in love with. Love how it has a colorful, vintage flair yet is modern. Very vibrant yet pretty and polished. You definitely DO NOT look like a pirate. 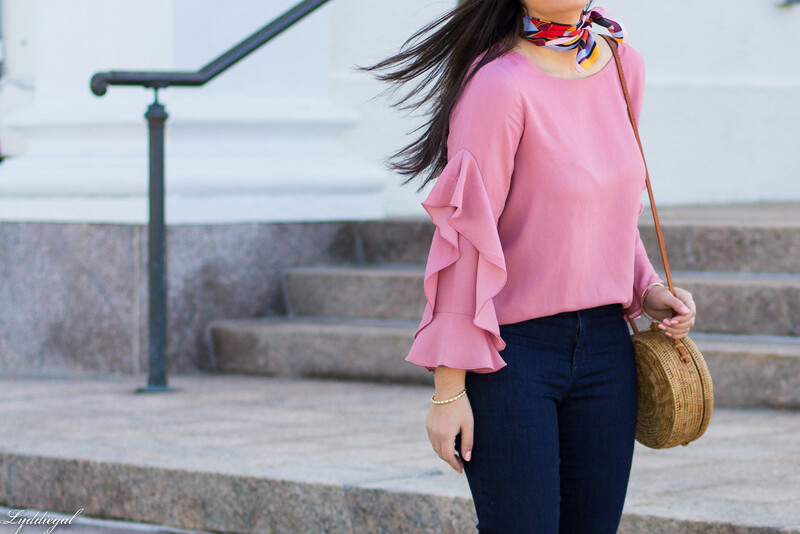 Your new pink blouse is gorgeous and I love the flared denim with it. Fun new IT circle straw bag too. Warm Spring weather needs to hurry! LOVE the bag, and the top!! Really pretty! I totally agree that flared jeans are sooo comfortable! But during winter, skinny jeans are more convenient (ya know to wear snow boots haha). And you do not look like a pirate! I love the neck scarf! It looks so cute! Flared denim is really the only kind I ever wear! Love how flattering they are and these look so great on you! 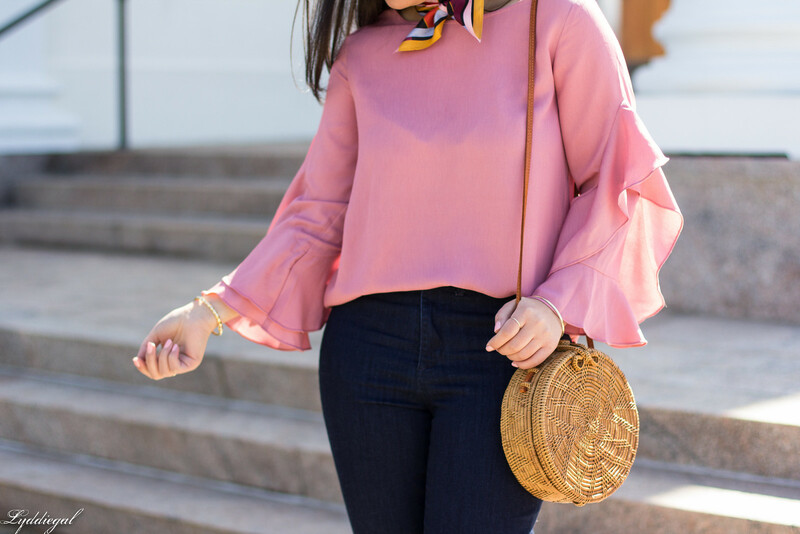 Love the pop of color with this blouse too...so spring chic! Lyddie you look amazing in these flares! 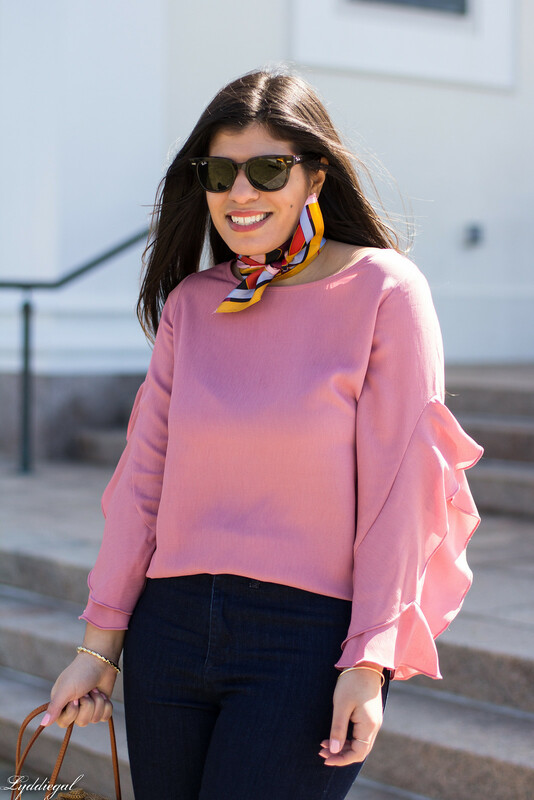 I love the little scarf that you tied here and I think that you totally rocked this whole look! I absolutely love the shirt and need to get one!!! You paired it so well with the flared jeans. What a great outfit! Ahh I love those!! 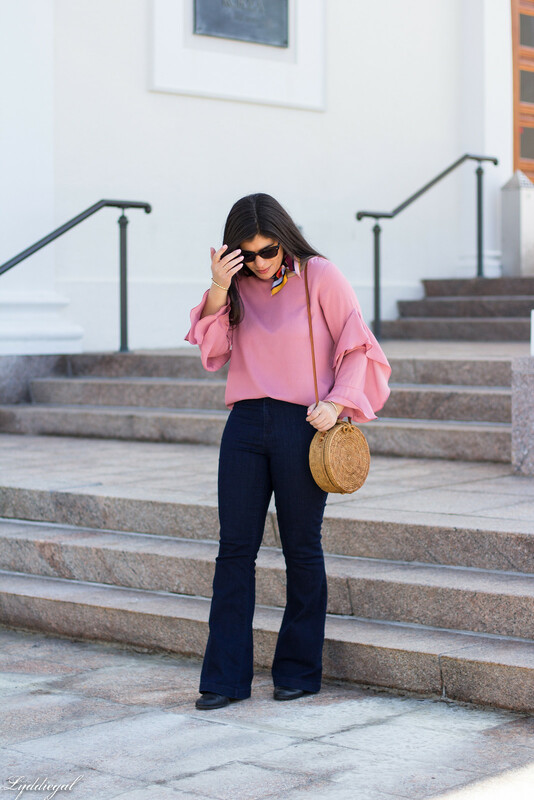 I’ve been on the hunt for a great pair of flare jeans...these might be it!! They look great on you! I definitely wore the same 3-4 pairs of jeans all winter too! 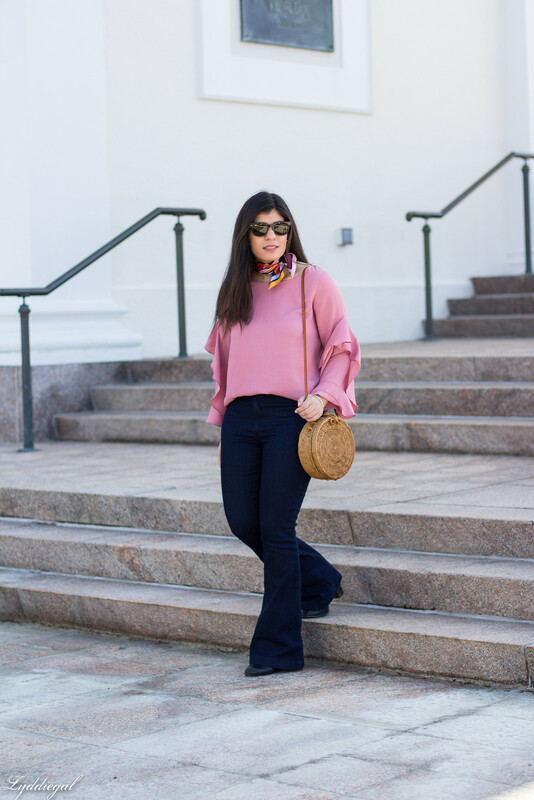 I love the flares and you styled them perfectly! 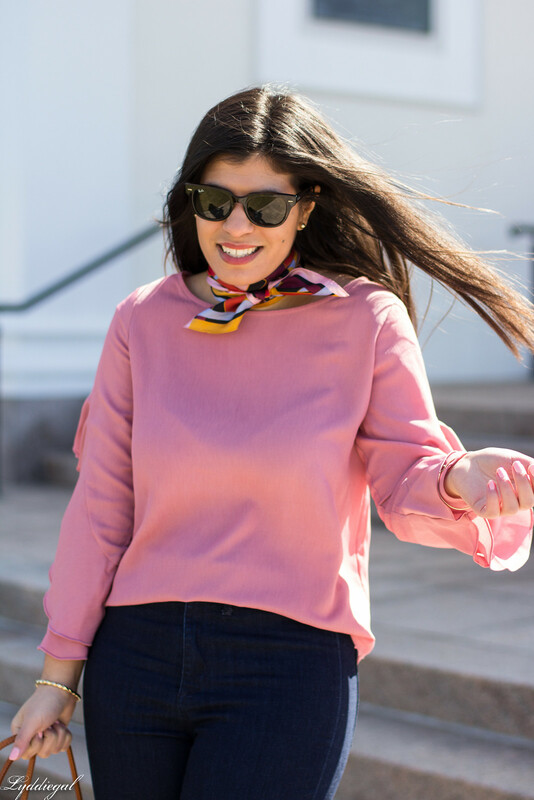 The neck scarf always adds that perfect touch of chic! Such a cute outfit! The jeans look super comfy! 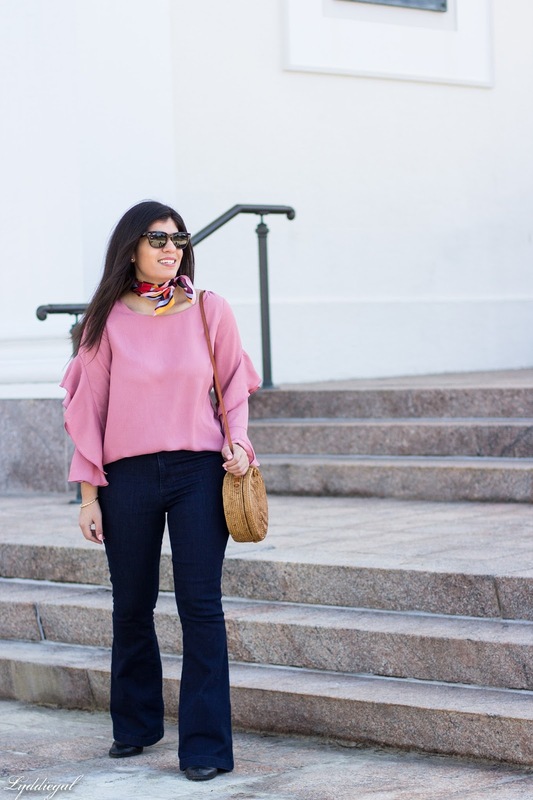 You can never go wrong with ruffles and flares, especially on spring! Loving the color of your top dear, so cute and chic! Lovely bag you got there too!